Timeform recap the inaugural running of the All Star Mile, won at Flemington by star Tasmanian filly Mystic Journey. Three big weeks of Flemington's Autumn Carnival came to a close with the All Star Mile and for the third week in a row we saw a three-year-old filly taking out the feature on the card. The Australian Guineas winner Mystic Journey took on the older horses and brushed them aside to add another big race to her ever-growing C.V. So we will give that a rest this week and focus in on Mystic Journey who edged her rating up again on Saturday and is now rated 124. A rating of 124 for a three-year-old filly is significant. It leapfrogs the star West Australian filly Arcadia Queen (rated 121) in this year's race to be the champion three-year-old filly but it also sits her at the pointy end of all three-year-old fillies to race in Australia this century. There have been only 25 fillies to be rated higher than 120 at three since (and including) 2000 and just two of them have been higher than Mystic Journey at 124 - Atlantic Jewel (rated 128) and Alinghi (125). These fillies might be able to tell us something about what the future holds for Mystic Journey. Mosheen and Miss Finland had also beaten the boys in the Australian Guineas, and they went on to be succesful in Sydney after that, but neither of them hit the same heights at four. Miss Finland won the Memsie and was rated 121 as a four-year-old while Mosheen was given a fairly conservative four-year-old campaign, winning a Blazer Stakes but rating only 112 in the process. Alinghi wasn't on Australian turf again and Atlantic Jewel missed her four-year-old year with injury before a five-year-old cameo where she reminded everyone of just how brilliant she was, winning a Memsie and an Underwood in scintillating style to be rated 127. She was brilliant, and perhaps had injury not struck again she would have toppled that three-year-old mark, but it's not easy when the bar is set so high. It's much easier to slide down than keep pressing on when you are already so far up the mountain - there are few worlds left to conquer - but Gold Edition did just that. She improved to be rated 125 at four, winning a Manikato and running a pair of memorable seconds to a then in-the-zone Miss Andretti. Gold Edition came from humble beginnings and was tough as nails, and in that sense she is perhaps the closest fit to Mystic Journey. 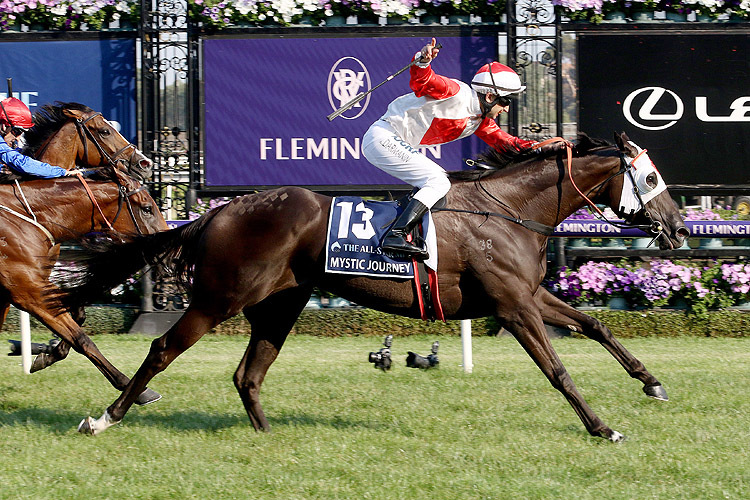 We can only hope that Mystic Journey's future follows a similar path to Gold Edition's memorable four-year-old spring.